The Free MPGomatic Sticker giveaway has come and gone. We may offer them for free again in the future. 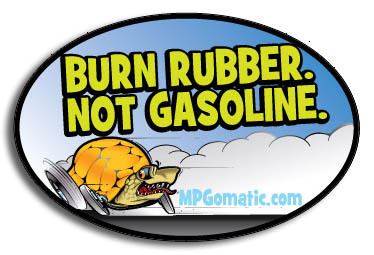 In the meantime, we’re selling a limited number of MPGomatic stickers. You can buy one, two, or three stickers at a time. If you order three stickers, we’ll throw in a bonus sticker … a special round edition that pays tribute to the super cool custom MPGomatic Poker Chips that we’ve given away at industry events like the SEMA Show in Las Vegas. Ordering stickers is easy. When you click the Buy Now button, you’ll be taken to PayPal’s website. You can pay for your order with PayPal or with a major credit card (including Visa, MasterCard, American Express, and Discover). PS: Our stickers were printed by our friends at StickerGiant. They did an awesome job. We will be printing a bunch of crazy stickers with them down the road.